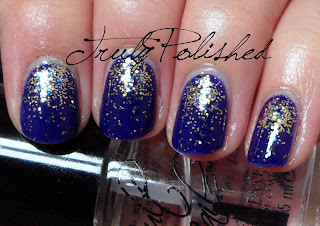 Today I have a NOTD post for you. I fancied trying something new today with my nails and I've had this combo in mind ever since I bought Models Own Disco Heaven (from the HedKandi collection). I love the combination of gold and purple, I think it looks so luxurious, and I haven't worn a sparkly glitter in ages (my mani before this was Dollish Pollish Putting On The Ritzzz - coming up soon) so I needed sparkle in my life! I put on two coats of Barry M Indigo with a coat of Cult Nails Wicked Fast last night and left it to dry overnight. The overnight bit was definitely pointless, just make sure it's totally dry before applying the glitter! Honestly, I just wanted to leave myself something to do this morning! I applied the glitter using a sponge. Any sponge will do, the one I used was yellow one that's normally used to clean cars! It cost me 50p from ASDA... I just tore a small piece off for this. The method I used was to place a big drop of the glitter polish at the base of my nail and then spread it by dabbing upwards, then I dabbed the excess off more towards the free edge of my nail to make it look a bit more scattered. To level this out, I used a thick coat of Seche Vite with a coat of Cult Nails Wicked Fast on top. Surprisingly my nails didn't seem thick, which made me happy because I can't stand thick nails, it feels like I'm wearing falsies! I would have taken more photos but my camera was struggling to focus on the amazing glitter, there was too much sparkly prettiness for it to handle! Hope you like it, I'm so pleased with how it came out! Normally I change my nail polish every day but I think I'll keep this on for tomorrow as well!